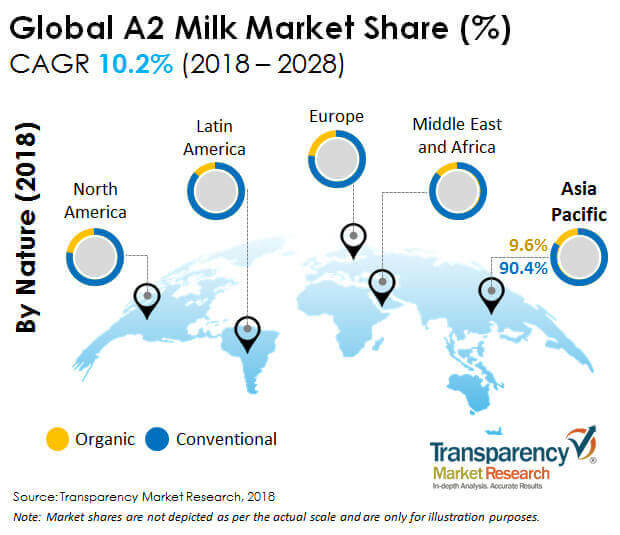 Transparency Market Research presents brief insights into the global a2 milk market, in its upcoming market report titled, 'A2 Milk Market: Global Industry Analysis and Forecast 2018-2028'. The global a2 milk market is estimated to be valued at around US$ 1,541.4 Mn in 2018. The a2 milk market is projected to register a CAGR of 10.2% in terms of value during the period of forecast, due to various factors influencing the market, regarding which, Transparency Market Research offers detailed insights. The urbanization trend and increasing per capita income have changed the eating habits of consumers in Asia Pacific. The number of health-conscious consumers has been increasing; consumers prefer healthy food even though it is costlier. Also, with increased purchasing power for healthy foods, Asia Pacific is experiencing a significant compound annual growth rate in the global a2 milk market, due to the increasing consumption of dairy foods containing a2 milk. It is expected that, Asia Pacific would have a high growth rate of around 11.8% in the a2 milk market in the coming years. Growing consumer health awareness has fuelled the demand for organic products. Consumers all over the world are opting for organic food, as organic products are much healthier and safe to consume. The organic a2 milk segment is expected to experience a significant growth rate in the coming years, due to consumer preference for organic and natural food products. Globally, the organic a2 milk market is expected to grow at a CAGR of 10.6% during the forecast period. Mother’s milk is necessary for the good growth and health of a child. But there are various cases where mothers are not able to feed milk to their children due to problems such as lack of milk production. For this, various infant nutritional products are being launched every year. A2 milk is considered to be a good alternative to mother’s milk, and can provide a sufficient amount of nutrients to a child. A2 milk is widely used in manufacturing infant formula and milk powder. The powdered a2 milk segment is expected to experience a high growth rate during the coming years, as it is widely using in infant powder and for dietary supplements. Milk and milk products such as cheese, butter, and cream are among the major ingredients used in bakery and confectionery products. In the past few years, the demand for bakery and confectionery products such as bread, cakes, and cookies has witnessed a tremendous increase, owing to the growing influence of the Western culture across the globe, which has significantly impacted the sales of a2 milk. The consumption of baked products is quite high in countries such as the U.K., Germany, Italy, the U.S. China, Russia, and Egypt. Around 40% of the global baked food is consumed in these countries only, which is expected to result in the high demand for a2 milk over the forecast period. TMR has profiled some of the most prominent companies active in the global a2 milk market, such as The a2 Milk Company Limited, FREEDOM FOODS GROUP LIMITED, Fonterra Co-operative Group Limited, Vietnam Dairy Products Joint Stock Company, Gujarat Cooperative Milk Marketing Federation Ltd., Provilac Dairy Farms Private Limited, Vedaaz Organics Pvt. Ltd, Ratnawali Dairy Products LLP, and Erden Creamery Private Limited, to provide a wider view of the a2 milk market across the world. Considering the consumer preference for natural ingredients, key global manufacturers and product developers providing a2 milk are focused on producing organic a2 milk by providing organic feed to cows. A2 milk is being increasingly consumed by people who have issues with regular milk consumption.